This group is for anyone who loves Jen Kingwell's patterns! Open to all quilters whether you’ve sewn one of Jen's patterns or not. Meetings will cover tips and tricks for both her Bakers Dozen and Golden Days patterns. 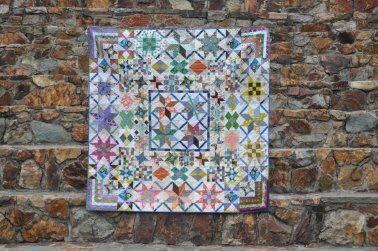 In addition to learning more about Jen and her collective of designers you will learn about Australian quilt culture, color theory and more. 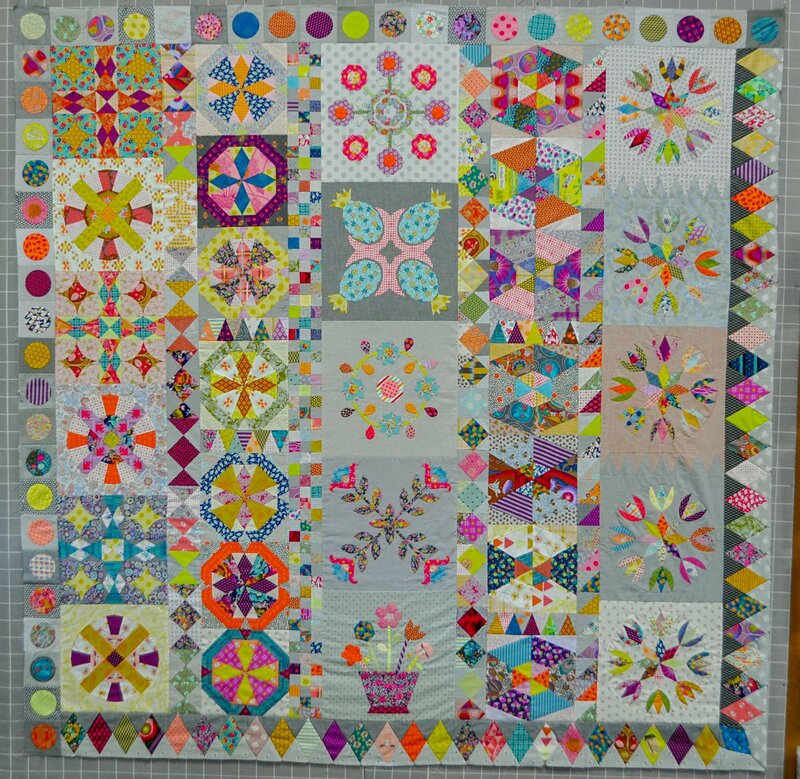 Come and show your past or in-process Jen Kingwell quilts, and check out what’s new in her patterns and fabric designs. Annual membership will include meetings the third week of each month for 13 months, December not included, beginning April 19th 6:30-9pm. After the first month’s introductory meeting, day or evening meeting times are available. Purchase of either Bakers Dozen or Golden Days patterns are suggested, but not required to join the group. Kits are also available for both quilts. 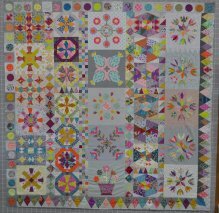 Bakers Dozen is a star-themed medallion quilt measuring 72"x72” when finished. The entire pattern and templates for this quilt will be given at the first meeting. This quilt contains one center piece and 3 borders around the center using 13 different star blocks, which we will take mostly one at a time for 13 months. Blocks are 6” and 12” finished. The Bakers Dozen pattern uses both traditional patchwork cutting instructions as well as templates. Jen Kingwell’s templates are sturdy, exact, and very well made – just like Jen! To purchase Bakers Dozen Book click here and Templates here. Golden Days is Jen’s newest Block of the Month pattern and templates will be available the first of each month for a year. Block techniques include the unique and original design style we have come to know and love, this time using traditional patchwork as well as applique. The applique method taught and mainly used in this class will be tear and wash foundations with glue sticks and either hand stitching or machine applique for placement. The templates will include Jen’s high-quality orange plastic, as well as some mylar pieces for the applique blocks. To purchase Golden Days Block of the month, click here. Class meetings are every third Wednesday 10am-12pm. Each month templates and pattern will be provided in class. If you purchased the fabric kit, all 190 unique fabric pieces will be provided in the first class. If a kit was not purchased from the store, please plan on using around 190 different fabrics from your stash, in mostly fat sixteenth sizes (9x11”), with some fat eighth (9x22”) or fat quarter (18x22) pieces for applique backgrounds. A large variety of lights and darks with varying size prints/motifs are recommended. Cutting mats, rulers, ironing boards and irons will be provided in class if you would rather use those. We will go over several of these notions, and as always, they will be available for purchase at The Quilter’s Lodge before or during class. The entire pattern and all templates will be given during the first class. If you purchased the fabric kit, all unique fabric pieces will also be provided in the first class. If a kit was not purchased from the store, please plan on using around 8 yards of fabric from your stash, in mostly fat sixteenth sizes (9x11”), fat eighth (9x22”) and fat quarter (18x22) pieces. A large variety of lights and darks with varying size prints/motifs are recommended. You will also need ¼ yard of border fabric for the frame around your center piece. Kristin Barrus is an experienced patchwork artist who specializes in Modern quilting. 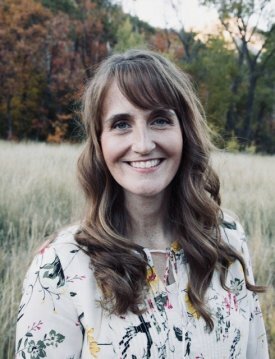 She is the co-founder of the Utah County Modern Group. She enjoys collaborative sewing and believes that the creativity of others is contagious when sewing in a group. She loves seeing what others make and firmly believes there is room for everyone’s fabric art in the world.